News | AMERICAN NUDIST RESEARCH LIBRARY ®, Inc.
Jul 15, 2015 Added a page Naked: A Cultural History of American Nudism This is a New Book Release by Brian Hoffman. Check it out!! May 12, 2015 Added a page Naked at Lunch This is a New Book Release by Mark Haskell Smith. Check it out!! May 12, 2015 Added a page Recommended Books and Videos This is the place to check out the next time you get the urge to read a nudist book or watch a nudist video. If you have a favorite book or video that you want added to this list then contact the library and we’ll add it to the list. Mar 07, 2015 Wrote a page National Library Week as a start in celebrating this event. Feb 28, 2015 Pete Williams (AANR Staff Writer) interviewed Bob Proctor (ANRL Secretary) today for an article in the April 2015 Bulletin. The article will feature both National Library Week and updates at ANRL. An About Tab was added to the top menu. It includes the Welcome message, library components, initiatives and the Digital Project section. Feb 26, 2015 An article Main Components of ANRL reports the six major components of ANRL. Feb 26, 2015 An article Main Initiatives at ANRL lists many of the initiatives which are happening today at ANRL. A Video Interview of Helen Fisher by Dave Graber is the second in the series of interviews we are doing this year. A Video Interview of David Foote by Dave Graber is the first in the series of interviews we are planning. We plan to interview the Hadleys here at Cypress Cove and some AANR dignitaries when the AANR Trustee Meetings are held in February 2015 at Cypress Cove. 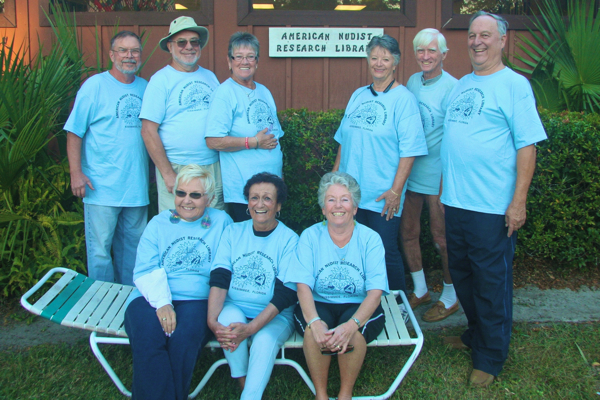 ANRL’s annual Membership Meeting was held Jan 16, 2015 at the library in Cypress Cove. The significant event was Election of Officers. Our new Vice President is Edward Waller who has also served at President. Remaining in office are Dave Graber as President, Roger Vonland as 2nd Vice President, Bob Proctor as Secretary, Roe Ostheim as Treasurer and Ted Hadley as Director. ANRL will start a series of video interviews and the first will be with Dave Foote, a long time ANRL member. ANRL held its annual Holiday dinner with over 20 volunteers attending. The November Cypress Cove Resident’s Party was hosted at ANRL and we had over 60 attendees. Folks mingled, chatted, ate the pot-luck style meal and drank the beer and wine which was provided by the library. It was a very relaxing and enjoyable time. Many attendees toured the library for the first time. We now have a couple new volunteers and several prospective members as a result of this wonderful event. The American Nudist Research Library (ANRL) is located within (but independent of) beautiful Cypress Cove Nudist Resort and Spa in Kissimmee FL. Its mission is to collect and preserve nudist history in all forms and make it available to researchers, scholars, nudists and other interested people. To that end, it has assembled the largest collection of nudist information that exists anywhere in the world today. The Library has been aware of its collection’s vulnerability to the ravages of natural and man-made disasters but, until the dawning of the digital age, there was little that could be done to protect it from anything other than the most basic threats. The advent of digital imaging technology and particularly the development of affordable book scanners capable of delicately scanning fragile bound volumes changed all that. The Library was quick to seize the opportunity and initiate its digitizing project. After a brief fund-raising period, the generous support of the nudist community allowed it to acquire state-of-the-art scanning equipment. To date it has scanned its Who’s Who files, club files and more than 1,500 magazines. As soon as those images are created, they are backed up on digital media for safe off-site storage. Although the Library’s emphasis has been and will continue to be on preservation of its material, it is now beginning to consider how the scanned images should be organized, cataloged, displayed and accessed to provide maximum usefulness to researchers and scholars. That is a real challenge! It is where a research librarian, curator or IT professional who is skilled in research data presentation could be a huge help in developing an optimum plan. The person might be a volunteer living within driving distance of Kissimmee, FL who would consult with us on an on-going basis. Alternatively, the person might be someone who would like a good excuse to enjoy a few sunny days at beautiful Cypress Cove while working with our staff to analyze our needs and propose a plan. The person could then consult with us by conference call as necessary to guide the Library’s implementation of the plan. If you have the required skill and would like the satisfaction of knowing you played a major role in preserving nudist history for future generations, please call the Library at 407–933–2866 and leave a message. Or, you can email your contact information to anrl@anrl.org. Either way, we look forward to hearing from you and discussing the specifics of how you might play a vital role in advancing our collection of nudist history into a modern, efficient Research Library for scholars, researchers and your fellow nudists. Feb 22, 2014 ANRL had a “Wine and Cheese” event at 5:30 PM on Feb 22, 2014 with ~49 attending. The visitors were mostly AANR Trustees who had attended the Trustee meeting at Cypress Cove. A number of cash donations were presented to the Library to help with the Digital Preservation Project. ANRL’s Jan 17, 2014 Membership meeting in the library was attended by 17 members and guests. Election results: President is now Dave Graber, Secretary is now Bob Proctor, John Frakes continues as Vice President, Roger Vonland continues as 2nd VP and Roe Ostheim continues as Treasurer. We will post minutes of the meeting and provide profiles of our Staff members on our Web site. We’re continuing our scanning project but could use volunteers to help a few hours a week with scanning. We would provide the necessary training. A computer terminal is now available in the library for visitors to view the more than 1,500 scanned magazines. The new Board soon will soon be addressing many issues which range from planning our 35th Anniversary Event to rejuvenating our Library. Please visit us at the library. We now have a new Member Application Form suitable for Emailing to a friend, adding to a Web site, or adding to a Club Newsletter. Feel free to download this form and make it available to potential new members. There was a Board Meeting of ANRL on Dec 15, 2013. There were two significant announcements at that meeting. First, Helen Fisher announced that she is resigning as Secretary after many years of service to the library, serving both as President and Secretary. Second, ANRL President Edward Waller announced that he will be stepping down as President. In the words of General Sherman, “I will not run if nominated, and I will not serve if elected.” So with the loss of two important Board members, and with the election of officers approaching in January, 2014, we need some help. A nominating committee is hard at work getting a slate of candidates. If you are interested in helping the Library in any way, please contact us and tell us what you could do. The ANRL Web site has a http://anrl.org/please-donate page which details volunteer positions, many of which could be filled from the comfort of your home. There are 5,063 magazines in the database and ~1,222 have comments with subject material contained in the magazine. This page points to 5 web pages that show the comments. Use the “find” feature in your browser to search the comments and identify the magazine with the found text. I had to use 5 pages because there is a size limitation for single page. * New photos for the little slideshow on the landing page. A list of Archived Books has been added to the ANRL Web Page The list of 580 titles was taken from the Libraries’ FileMaker Pro Database. You can view the page here. A new Facebook group has been started for American Nudist Research Library. There are many purposes of this group and some of them are: to report current Library events, increase awareness of the Library, increase the number of Library visitors, strengthen the core of Library Volunteers, search for skilled individuals who could step in and solve some difficult technical issues, and to discuss the content of our modernized Web Site. I hope you enjoy watching and participating in this new group! The American Nudist Research Library (ANRL) is wanting to “expose itself”, get more visitors, more volunteers and more publicity. In an attempt to do that we have tried to enhance our visibility on the Internet with a modernized web site which is alive with new content, has listings of titles of our scanned documents and surplus magazines and which uses better search engine optimization techniques. A more direct approach to accomplish our goal would be for all nudist organizations and clubs to link to the Library in their web sites and newsletters. We are asking for your support to help us reach our goal. The statistics on ANRL’s Local-Web-Page have been updated to show the new count of .pdf files.